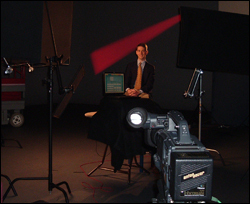 Herrmann on the Public Health Training Network's television set. Associate Professor Jeffrey Herrmann (ME/ISR), along with Kay Aaby from the Montgomery County, Md. Advanced Practice Center for Public Health Emergency Preparedness and Response, spent a day in Atlanta last week taping a television show for the federal government's Centers for Disease Control and Prevention (CDC). Herrmann and Aaby spoke about the partnership between the University of Maryland's research group and the Montgomery County government in making mass dispensing/vaccination clinics more effective and efficient. Herrmann also demonstrated his Clinic Planning Model Generator software, which the CDC requires agencies that receive federal funding to use in setting up clinics. Mass Antibiotic Dispensing: Taking the Guesswork out of Point of Dispensing Design aired on June 21, 2007 and is available to view online at the CDC's Public Health Training Network.